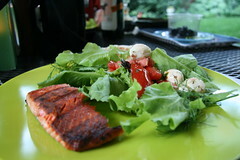 Ahhh - summer dinners. 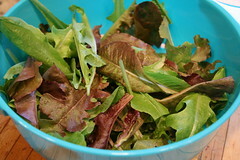 As usual, the main item on our plates is my garden lettuce. 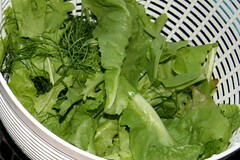 This seems to be the summer lettuce slump though. It isn't growing as well as it did in the spring. I've been planting it about every 3 weeks, but right now it isn't growing very well. 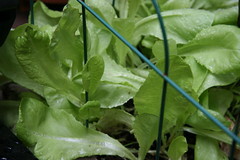 What is doing good is the escarole (Natasha), which is heading up and is delicious still from an early spring planting. I just planted a similar variety yesterday for a fall/winter crop, but I'll also try to remember to plant an extra row of escarole next spring. Very tasty. From top left these photos are: Sunday dinner with salmon and garden greens, harvested escarole and dill, harvested Gourmet Mix lettuce, Butterhead lettuce (planted June 2), and Heatwave Blend lettuce (planted June 2nd). 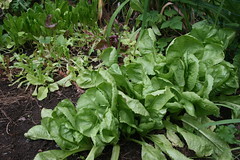 The lower right photo shows escarole Natasha in foreground (planted in April 9) with Gourmet Mix (planted April 9) and Romaine (planted May 28) behind. 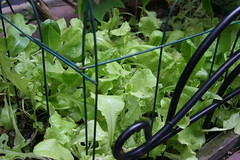 nothing like fresh lettuce, mine is a bit toasty... a shadier spot is in order next spring. also cool to see the carrots. truly an item to spoil one's taste buds. I have one plot that turns out is too shady. I'll skip that one next year. But I think the bed with 12-5pm sun works well. Maybe the lettuce would head better in full sun when the weather is cool. I don't get much in the way of heads.